Do you need a visa on your passport to enter the UK? With all the current immigration concerns and Brexit looming for Britain in the not too distance future, you don't want to make any mistakes that could get you sent packing before you've even set foot on British soil. Don't panic. It's not really that difficult as long as you know what you need to do ahead of time. Whether you need a visa for the United Kingdom depends upon where you come from and why you are coming. Here are the facts as of September 2018. If you are a national of the United States, Canada or Australia, or live legally in those countries, you don't need to apply for a tourist visa before you enter the United Kingdom. Visas, usually for visits of up to six months, are granted on entry, when you present your passport, as long as you satisfy the immigration officer that the purpose of your visit meets UK Immigration Rules. There is no charge for this kind of visa granted on entry. If you have a criminal record or you've been refused entry to the UK before, it's probably a good idea to apply for a visa before you show up an an airport or port of entry, just to be safe. If you plan to study for up to six months, you need to apply in advance for a short term study visa. In 2018, this visa cost £97 for a short term course for up to six months and £186 for 11 months if you are taking an English language course. If you are 16 years old or older and are taking a university course or a longer study course, you need to apply for a Tier 4 General Student Visa using the UK points system. This visa costs £348 (in 2018). You will also have to pay the Healthcare Surcharge (£150 per year of study) when you apply. Different rules apply for child study visas and visas for students with dependents. Find out more about eligibility and rules for student visas. The rules that apply for work visas depend upon what kind of work you will be doing, your role in your organization, and how long you will be working in the UK. If you come from a Commonwealth country and at least one of your grandparents was a UK citizen, you may be eligible for a UK Ancestry Visa that is good for five years. The Healthcare Surcharge is charged to people coming to the UK to work. Find out more about work visas. You are joining a family member, who is a UK citizen or who is permanently settled in the UK, for a longer stay. You are coming to the UK to get married. If you are a citizen of a country that is a member of the European Union (EU), The European Economic Area (EEA), or Switzerland, you don't need a visa to visit, live in or work in the UK. But that will change soon (See the EU Settlement Scheme, below) You will need to carry a passport or European identity document. If you arrive in the UK as a diplomat or on official government business for your country you won't need a visa. Family members joining you or traveling with you probably will need one though. If you are living in the UK as an EU Citizen and wish to remain indefinitely, you need to apply for settled status to be able to remain as normal after Brexit. In order to remain past December 2020, you will need to apply for settled or pre-settled status. The program for applying will be fully open by March 2019 and you will ave to apply before June 30, 2021. You can sign up for email updates to find out when the registration program opens. The Settlement Scheme status has (as of September 2018) not been decided for citizens of Norway, Switzerland, Iceland and Liechtenstein. Citizens of Ireland and their families have leave to remain in the UK indefinitely and do not need to apply for Settlement. In April 2015, the UK government implemented new rules to prevent health tourists coming to the UK to use the free National Health Service (NHS). If you are coming for long term study or to work, part of your visa application process is payment of a health surcharge. The fee covers every year of your stay in the UK. Although it may seem expensive, it is far cheaper than private health insurance for the same period and it allows you to use the NHS in the same way as British citizens and residents can use it. Does a UK Visa Give Me Access to the Rest of Europe? Within the Schengen borders, visitors with a Schengen Visa, can travel freely, from one country to another, without border controls. The UK and Ireland opted out of this part of the Schengen treaty. So if you are visiting either, you will need a separate Schengen visa to travel in Europe and Iceland as well as a UK visa. Check here for a full list of countries currently in the Schengen area. 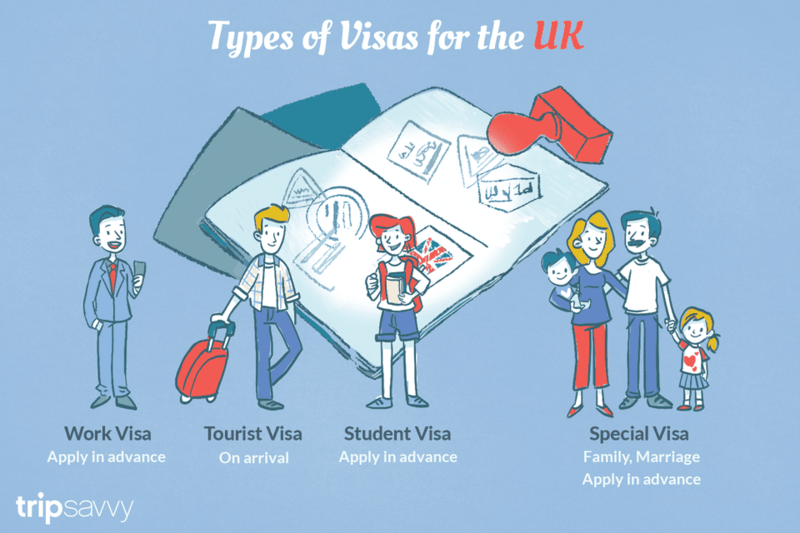 If you're still not sure whether you need a visa, visit the UK's very handy online questionnaire ​Do I Need a UK Visa. It's a step-by-step questionnaire that will lead you to definitive answers on the visa conditions for citizens of your country and the kinds of visas that are available. If it does turn out that you need one, you should allow at least three months for your application to be processed. You can apply for, and usually pay for, a visa online at Visa4UK. You must be outside the UK when you apply. Alternatively, you can apply for a visa at a UK visa application center in your own country. Find a full list of visa application centers here.